As the trailer educates us, "Sicario" means "hitman" in Mexico, and Emily Blunt plays one of a trio of law-enforcement agents who cross the border on a shadowy and mysterious assignment to track the head of a brutal syndicate, hoping to eliminate his growing threat. At the onset of the trailer, Blunt’s character looks like a stranger in a strange land, a fish out of water who is going to have a very hard time comprehending the dangers to which she has aligned. However, Sicario looks like it packs multiple twists, as characters on both sides of the fight likely will trade allegiances, making Blunt (and the audience) wonder who they can really trust. Earlier this year, Sicario held its world premiere at the Cannes Film Festival, where it earned rave reviews. Variety referred to it as "blisteringly suspenseful," while Time Out’s critic referred to it as "stern, robust, abandon-hope-all-ye-who-enter thriller." Of course, that should probably be expected from the director of Prisoners, which was itself a no-holds-barred plunge into darkness and psychosis that tracked a petrified father (Hugh Jackman) on the hunt for his missing child. Denis Villeneuve did well to surround his lead actress with notable tough guys in Benicio Del Toro and Josh Brolin. But because we’ve seen shades of their steely demeanor before, it’s more surprising (and more refreshing) to see Blunt build on the action-star fanbase she started to attract with Edge of Tomorrow. 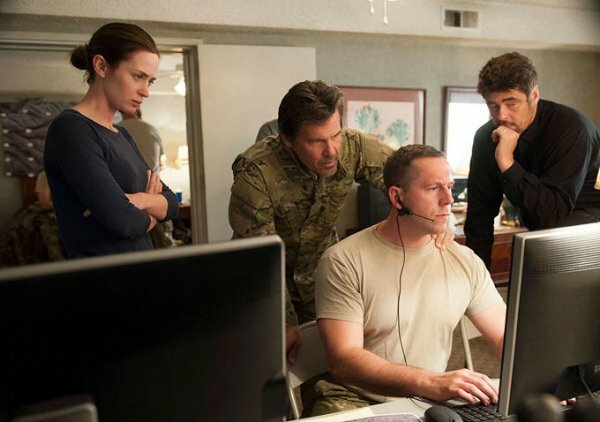 You can guarantee that an September release date for Sicario means that Lionsgate will be hitting the film festival circuit of Telluride, Toronto and Venice, in hopes of establishing its place on the possible Oscar front. But even if Sicario doesn’t end up generating awards buzz, at the very least, it looks like it can provide a gritty fix for those who love gun-toting plunges into the arid, bloody world of Mexican drug cartels… and the brave men and women who dare to stand up to them on a daily basis. Sicario opens in limited release on September 18.